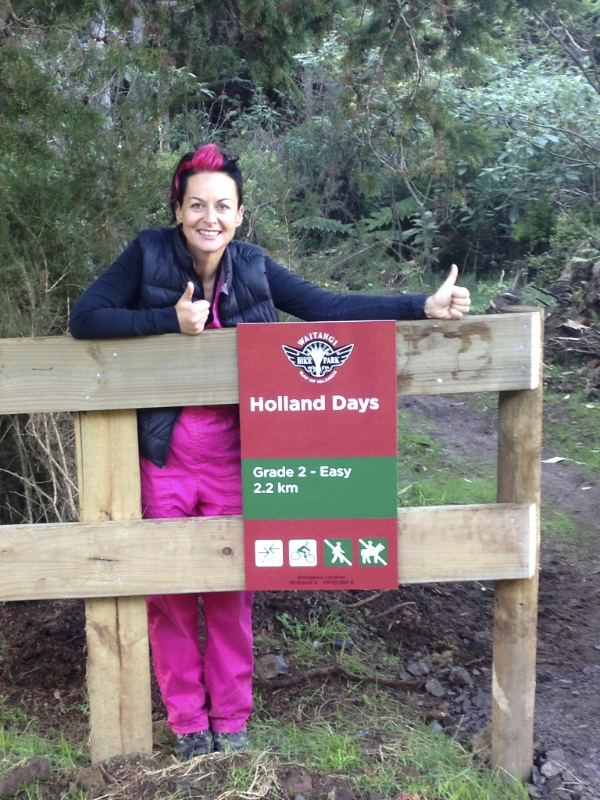 There are just so many reasons why we have two thumbs up for the WAITANGI MOUNTAIN BIKE PARK this month. If you had 10 thumbs, you’d have ’em all up! We are delighted to announce that FOUNDATION NORTH has approved a grant of $200,000 to FOCUS PAIHIA for the mountain bike park. FOUNDATION NORTH’s support at this crucial time in the project gives us the means, ability and confidence to continue works in what is shaping up to be an outstanding facility for Northland. This support is greatly appreciated and as the biggest donors to the project so far, FOUNDATION NORTH have proved they are leaders in supporting our region. Thank you FOUNDATION NORTH! Huge thanks to ROGER DOLD for all of his work with this successful application. The grant is magnificent recognition for the past 3 years of volunteer effort put in by the WMBP Team and also for the support, in financial and in kind, that has flooded into this worthwhile project from our awesome community. This certainly a key factor in the success of funding applications. Thank to all those who give dollars, materials or time… Zone 3 here we come! HOORAY! TRAIL HUB GETS THE GO AHEAD! As if $200K was not good news enough, more good news continues to roll in as the WMBP stars align. At last we can say that the DEPARTMENT OF CONSERVATION has granted permission to build the Trail Hub and Carpark. The final paperwork is in the process of being signed. Phew! Earthworks are booked to begin in a few weeks, though at this late stage of the season, it will be very weather dependant. There are a number of elements to complete the Hub – earthworks, landscaping/planting, new forestry gates, signage structures and portaloo platforms. We’ll need a couple of months to get everything ship shape (if the weather holds out!) so it’s looking like an early spring opening. This goal now more than ever within reach. In the meantime the WMBP TEAM have been as busy as ever and there are a number of thank you’s to be made. The outstanding contributions in kind from our community truly is outstanding… Thank you toALAN WHEATLEY and MARIUS GABRIELS from FAR NORTH DISTRICT COUNCIL for their greatly appreciated time and advice in relation to the Trail Hub and shuttle turning bay. Thank you to DAVID CASWELL and BROADSPECTRUM for preparing a Traffic Management Plan for us for these works, all free of charge. FAR NORTH HOLDINGS have kindly donated some of the materials for the Trail Hub. Thanks to CHRIS GALBRAITH for all of his assistance with this. 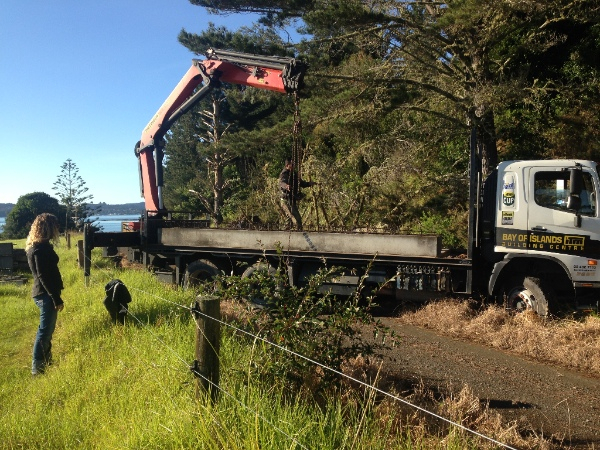 Huge thanks to the ever supportive BAY OF ISLANDS ITM TEAM who have provided hiab and transport for load after load of giant concrete blocks and old pier poles, from the FNHL yard in Opua, to the Trail Hub in Waitangi. Thanks to ITM Driver RANKIN SIONIMALI for his expert handling of such heavy kit. Always a pleasure to work with these guys. Thank you also toKANE and the team from RURAL DIRECT WHANGAREI who donated a host of culvert pipes that we have used around the park and thanks to ANDREW YOUNGER for organising this. Thank you to MANZ, BAY OF ISLANDS who recently donated another $2K to the project. With the exciting news about FOUNDATION NORTH funding we were straight on the phone to SOUTHSTAR TRAILS and were lucky to be able to squeeze into a window of the team’s busy schedule. 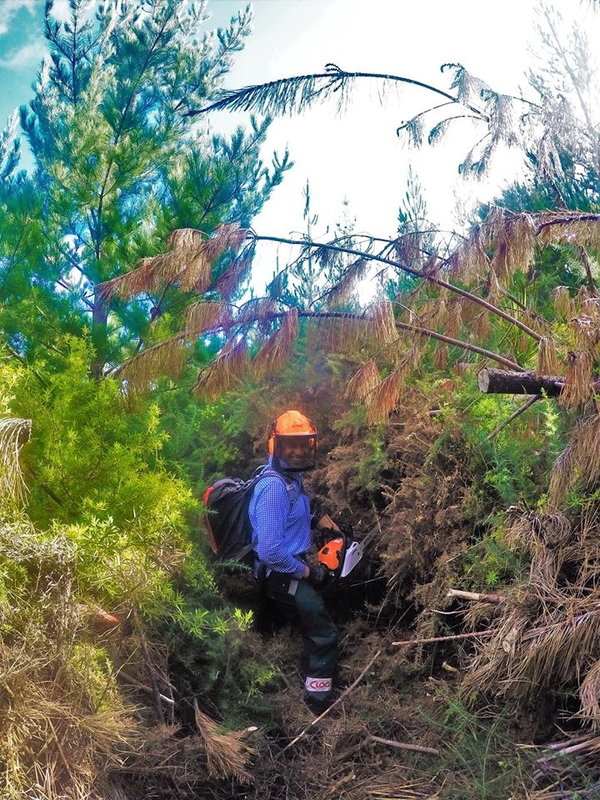 JEFF CARTER and NICK CROCKER are back and currently slicing their way through the maze of over head high gorse once again, with Jeff saying the WEF is the most challenging of all his projects to mark. 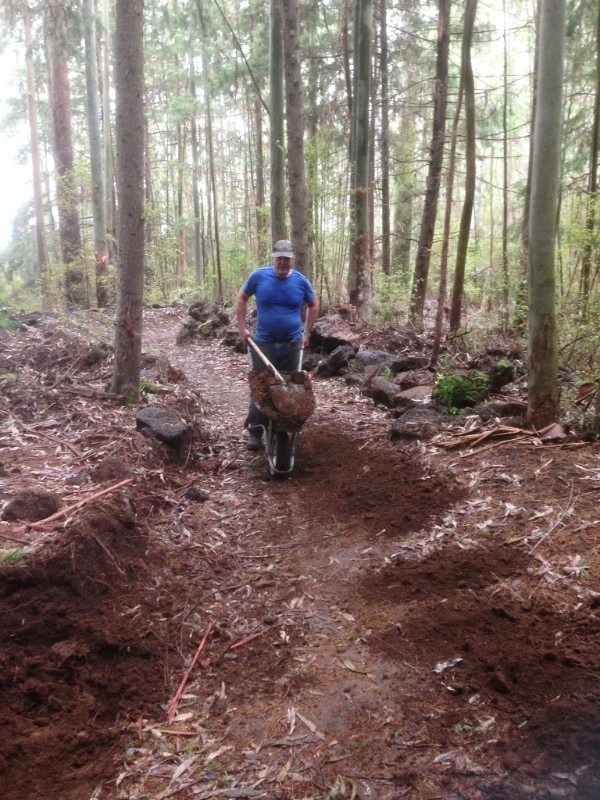 The crew are marking out as much as they can, so that trail approvals can be sought in advance, and not hold up construction when the new season of trail building begins. There will be 3 more down hill trails in Zone 2 (a grade 3, 4 and 5) and then it’s over the ridge to start on Zone 3. PIONEER WATERFRONT APARTMENTS have provided accommodation FOC for the Southstar Crew over the past two weeks. With award winning hosts MARK and VIVIEN JAVINS Pioneer Waterfront Apartments provides a luxurious rest for the trail crew after a long hard day of marking in the gorse and steep terrain. Thank you to the JAVINS FAMILY for their ongoing support of the WMPB project. Huge thanks to CRAIG SALMON for developing the new WMBP Volunteer sign up system. Knowing that there were many eager to support the core crew it was essential to have the correct system in place to manage the influx of support and to be able to manage the Parks Health & Safety obligations. You will have seen an email go out about volunteering earlier in the week. This was our first test of the system and the first official working bee. It all worked magnificently – we have had over 60 general volunteers sign up so far with 23 able to make it to the first bee, last weekend. A roaring success! Thank you CRAIG, we are so lucky to be able to access your IT prowess! 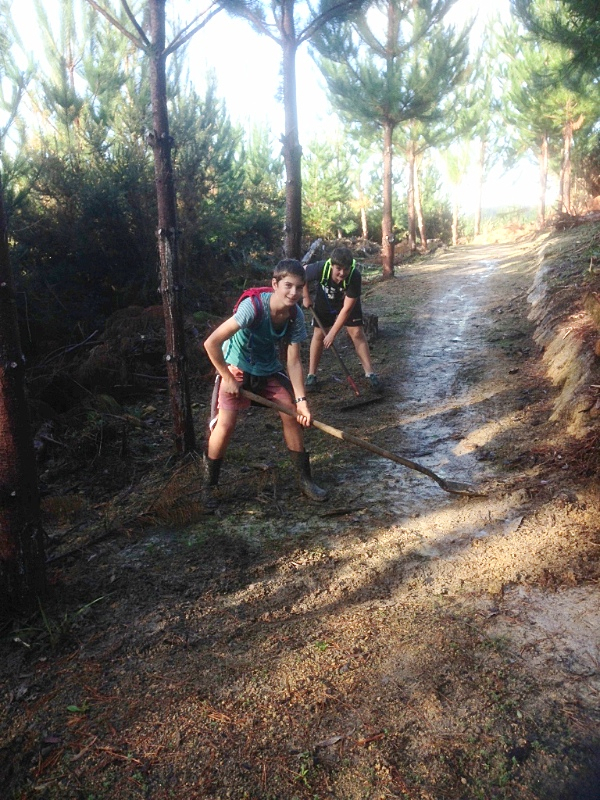 So, the time has come for the call out for VOLUNTEERS to join the core WAITANGI MOUNTAIN BIKE PARK CREW. The team have been putting in a legendary effort to date, but as an opening draws ever nearer, it is time to ramp up the help. We will be holding working bees within the park and trail hub carpark over the coming months, so if you are keen to get involved with this worthwhile community project. Huge thanks to GARY & LESELY LUCAS who have come on board as WMBP Volunteer Managers. Their assistance has been warmly welcomed by Tiff who has plenty on her plate in the planning and the logistics of the BEEs. In fact Tiff has her mind over every aspect of the park, so to have this support in managing volunteer communications and ensuring that all volunteers have completed the appropriate forms, is a tremendous weight off. Thank you GARY & LESLEY. Wow, what a turnout. 23 Volunteers were hard at work throughout the day in the first official WMBP Working Bee. They came from far and wide – Russell, Opua, Kerikeri, Haruru Falls, Waitangi, Waimate, Watea, Pakaraka and even Whangarei. 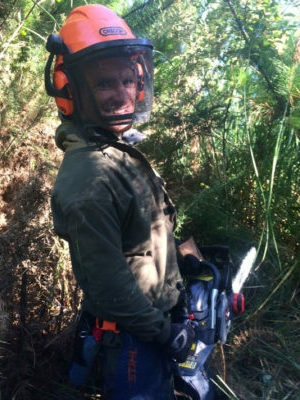 Split into teams of 3-4, crews were dropped at different points throughout the park and set to work raking and cutting back. The teams, that included many who had only just met, worked brilliantly together making great progress and the full length of trails were complete in much less time than expected. The many hands enabled a lot of ground to be covered to get the job done. Unfortunately Tiff was occupied with the briefing at the start and then busy raking during the bee – she forgot to take photos! There are a few pics here but an official working bee photographer is needed! There are just so many lovely people to shoot. Thank you to WMBP Volunteers – LESLIE GRANEY, JOHN GIBBS, KAREN MARKIN, GRANT HARNISH, TROY O’DONOGHUE, JAKE HARNISH, MASON YOUNGER, ROBIN & TIFF HOLLAND, CARL LE HERON, CHARLIE WITTS, STEVE MARTIN, DEREK PROBERT, BLAKE DODSON, GARY LUCAS, SUE LEYLAND, CARL HUDSON, RICK PALMER and TAUNAHA SMITH. ALL INTERNAL ROAD SIDE POSTS ARE IN! 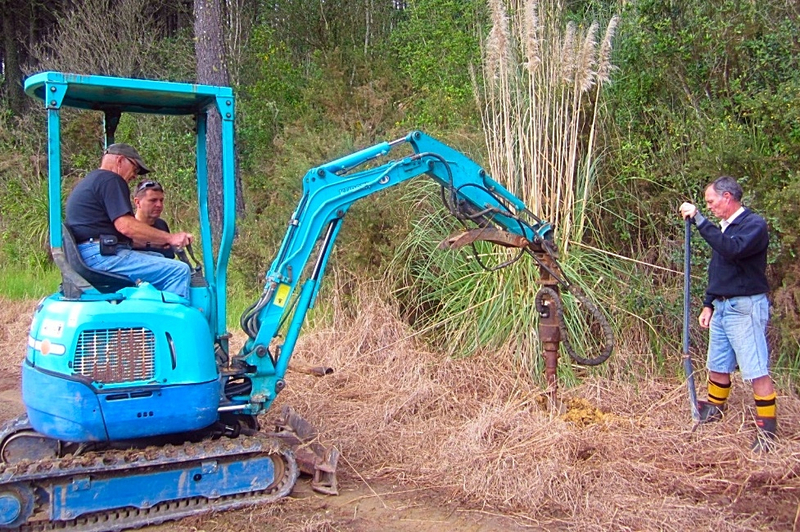 On 12 June, whilst the volunteer crew were at work on the trails, BRUCE GORDON worked his way along Te Wairoa Rd and Bledilsoe Rd assisting the post hole team with his digger and auger. Huge thanks BRUCE! Following closely behind Bruce was our post king ANGUS ROSS, supported by able hand ANDREW YOUNGER. Thank you all for your splendid efforts. This crew was expertly managed by RACHEL FUSSELL, WMBP Signage Project Driver. With over 100 signs throughout the park, Rachel has put in a tremendous amount of work coordinating all aspects of this complicated process. It is magnificent to finally be seeing the icing go on the cake. Thank you, thank you RACHEL FUSSELL! THE FIRST SIGNS ARE UP! All of the Trail Head signs are now up with huge thanks to ANDY GRIERSON and CLINTON SMITH ofA.W. GRIERSON BUILDERS who helped TIFF and RACHEL for the day to install them. The guys put up with plenty of instruction in the pursuit of perfection and the result is magnificent. NPC SIGNWORX in Kerikeri are producing the signage – Thanks to PHIL SNOWDEN and REGAN BATES for all of the too-ing and fro-ing with the design and taking on board the signage teams many requests. And thanks especially for the heavily discounted price! This has enabled us to create something really unique and extra special up there on the hill! The other 90+ trail and internal road signs will take a few more weeks yet to install, and timing depends on the availability of the volunteer crew, so no breath holding! But again, it is just so exciting to see them go up. Yahoo! 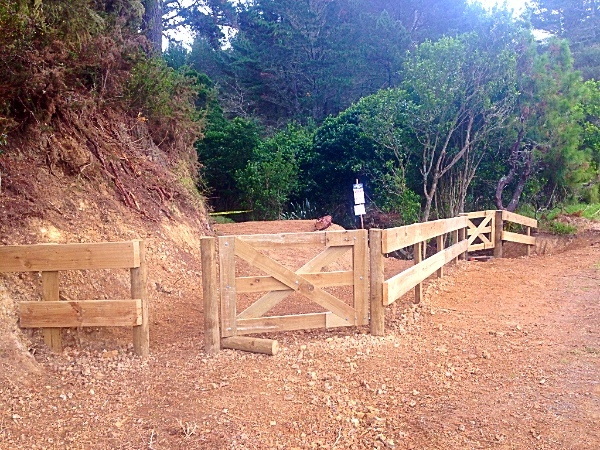 Not only did NORTHLAND REGION CORRECTIONS FACILITY provide a crew to install all but one road crossing barrier, they built all of the gates for the barriers in the prison workshop AND they donated the wood too! 8 gates in total and they are super flash. Thank you to NRCF Workshop Manager GARETH JONES who facilitated the project. Gareth also worked with WMBP volunteer CARL LE HERON and TIFF to build the final (and largest) of the road crossing barriers. Huge thanks to STEPHEN GRAY and BAY OF ISLANDS ITM for donating all of the wood for all of the barriers and especially for answering Tiff’s desperate call for the final round of wood to complete this last one! Legendary volunteer CARL LE HERON has swung ALL of the gates over the past few weeks. Amazing thank you CARL! 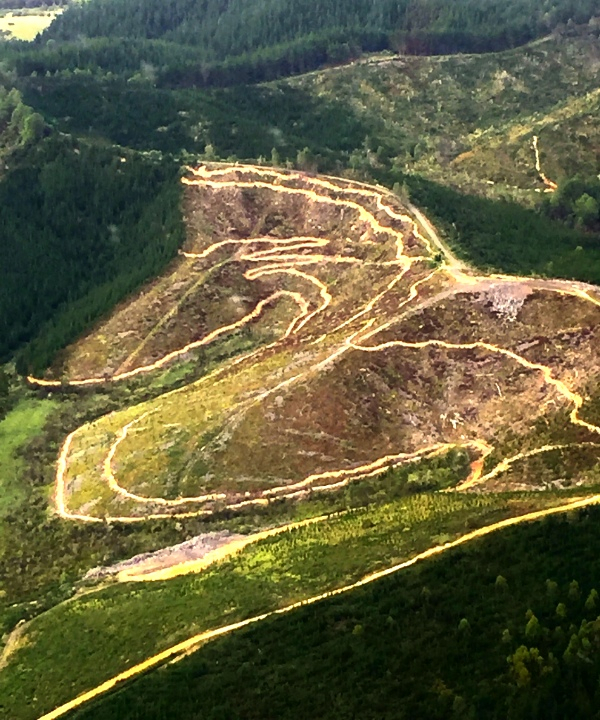 If you are a BUSINESS and keen support the Waitangi Mountain Bike Park by being part of the “Keep it up Club” (donation $1000) receiving acknowledgement in the Focus Paihia Newsletter and on the Waitangi Mountain Bike Park website (website yet to be developed), please download the form below.